Tampa Bay Security Gates has introduced a new maximum security storefront gate for retail store applications. Our new storefront security gate contains two times the steel our regular heavy-duty gates. 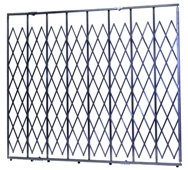 Extra heavy gate are a mixture of vertical metal bars and traditional scissor-folding style webbing to permit total overall coverage of area to be protected. Gates are designed with a constant frame on all sides including both fixed or folding top and bottom tracks. This extra heavy duty model comes with a fully galvanized, weather-resistant finish and can be powder coated for an added cost and lead time. We also offer custom built gates to a customer’s required specifications, applications and preferred aesthetics. We also offer galvanized security heavy-duty scissor, folding, access contro, portable, aisle and barrier gates.